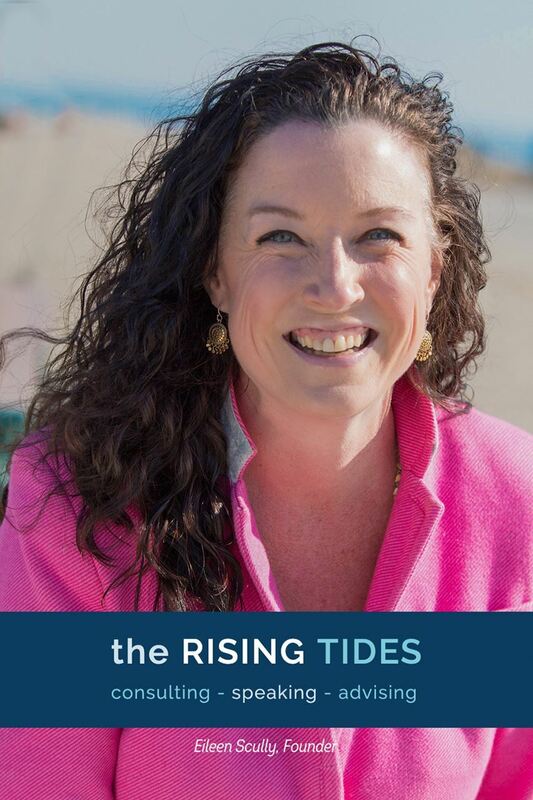 Eileen Scully is the Founder and CEO of The Rising Tides, making the workplace better for women through consulting and advisory services. She is an international speaker, and author of “In the Company of Men: How Women can Succeed in a World Built Without Them”, set for publication in the spring of 2019. She is a SheSource Expert with the Women’s Media Center, and has been interviewed by Forbes, the Boston Globe, Standard and Poor’s Global Market Intelligence, Thrive Global, Psychology Today, and Inc.. In June of 2016, she was invited by the Obama White House to participate in the United State of Women , one of five thousand global advocates for women and girls. In April of 2017, she spoke at the first ever Diversity in Marketing and Advertising Summit in London, the only event of it’s kind focused on fostering greater diversity and inclusion in the industry. In August of 2018 she spoke at the first Women In Engineering conference sponsored by the global Institute of Electrical and Electronics Engineers in Tunisia. In September of 2018, she delivered her first TED talk at the TEDx conference in Sfax, Tunisia. In November of 2018, The Rising Tides launched the Leadership Diversity Index, the first comprehensive measurement of the representation of women and people of color on corporate boards of directors and executive leadership teams. In December of 2018, Eileen was named to Irish America Magazine’s 2018 Business 100 list, the second consecutive year she received this prestigious and deeply meaningful honor. In the spring of 2019, her book “ In the Company of Men: How Women can Succeed in a World Built Without Them ” will be published. Much of her free time is spent working with The Get In Touch Foundation, on whose board she has proudly served since 2010. Get In Touch provides free breast health education to girls around the world, and to date have reached over one million girls in 34 countries, all 50 states. She also serves as an advisor to LEAP, Leadership & Executive Acceleration Program, which empowers Irish and Irish-American women to accelerate their careers by providing access to professional insights, mentors, and role models. This quarterly initiative for 2019 provides additional networking events and opportunities for IBO professional women. Inspiring female thought leaders and speakers are selected by the IBO and invited to educate, inspire, and motivate attendees. Participants will have the opportunity to listen to dynamic speakers, network and engage with attendees during these lunch meetings. RSVP: Attendees must RSVP by no later than 5:00 p.m., Tuesday February 5, 2019.